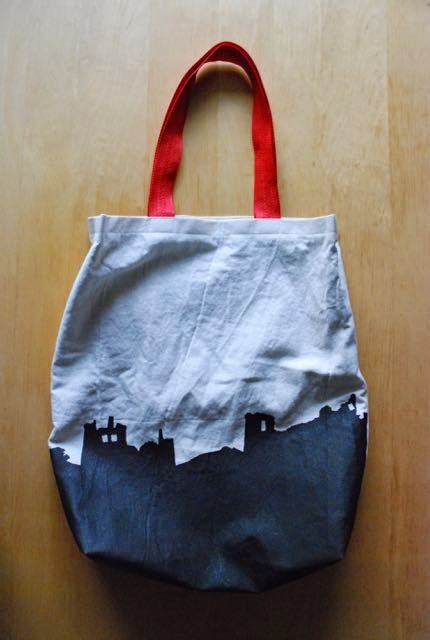 I've just made myself a new "Market Bag". I go to the market at least once a week (more often twice) to buy fruit, vegetables, sometimes meat or fish and, of course, fabric and notions. That means I have a lot to carry when I'm there and I have to be able to take it all with me on the short bicycle ride home. It won't surprise you that I'm doing all the carrying in a me-made bag... Although I like my market bag to look nice, it is mainly utilitarian and I don't replace it until I have to. The first one, which pre-dates this blog by quite a bit, was a clone of the store-bought bag which was performing the same service before it. 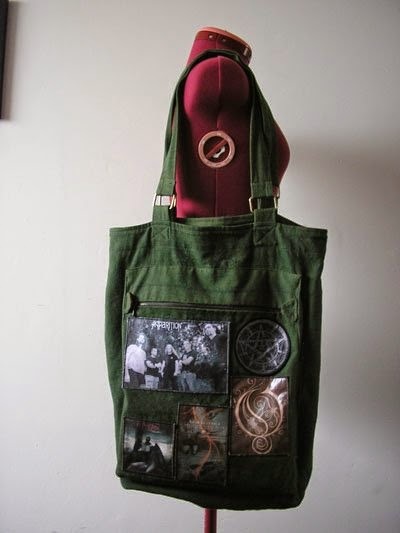 I made it in cotton canvas which I dyed olive green and decorated with self-made band patches (the big one is of my boyfriend's band at the time) Unfortunately, I lost it well before its time when it was ripped off the back of my bicycle in a little drive-by moped robbery. To replace it, I made another one using some Ikea fabric. This was in the early days of this blog and it has served me well ever since. However, it looks a bit tired now and recently, the zipper which I inserted it one side has started to tear at the corner. The zipper closes a pocket which I use to store my wallet, phone and keys. As a result, it is opened and closed quite a lot when the bag is in use. And when I'm filling the bag, the weight puts strain on the corners when the zipper is open. Not that I should be complaining, it has held up well for years. And so, I made a new one. 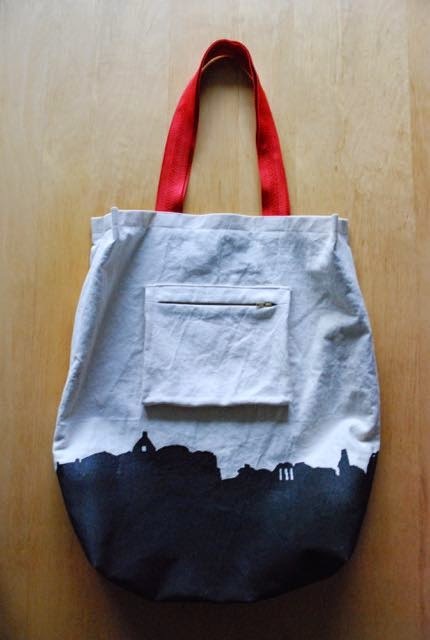 I used the same basic fabric as I did for the very first bag, just in its original un-dyed form. 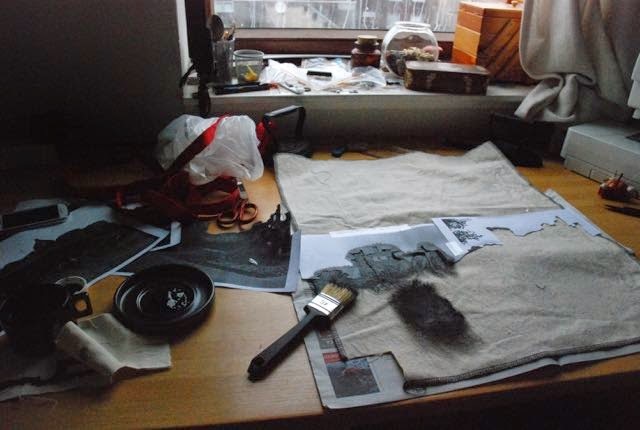 To decorate it, and to make it a bit more practical, I used textile black paint. I printed some of the pictures of castle ruins from my holiday in Scotland and cut out the outlines to use as templates. Not an entirely original idea, of course. The paint has made the lower parts of the bag a bit thicker and stiffer than before, which I think is just fine. 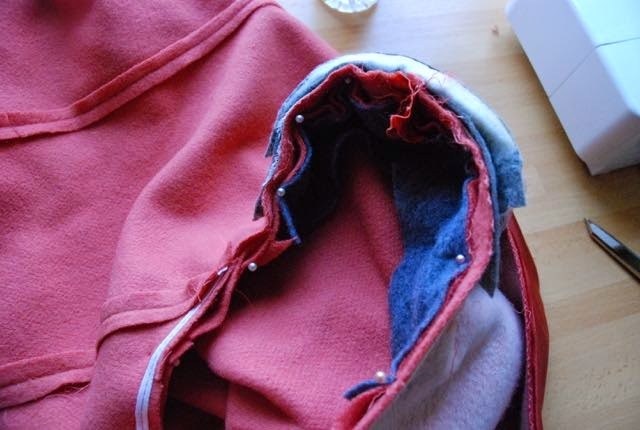 Instead of an inside pocket which opens to the outside, like before, I've made an expanding patch pocket. If you're interested, this is what the pattern looks like. The measurements include seam allowances and a facing of 3 cm at the top. My bag is lined and I used the same pattern piece for the lining, just cut 3 cm shorter at the top ( I know that means it's slightly too long but that's done on purpose. 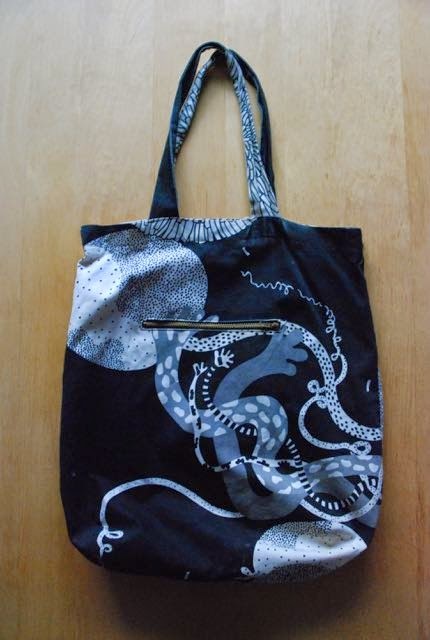 The outside fabric is strong, the lining isn't so I want to outside to carry the weight of the bag's contents). Obviously, you cut the bag piece twice and the pocket piece once. 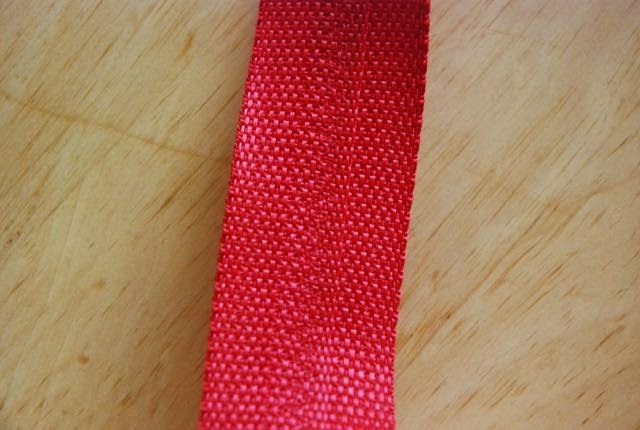 I used bought strap material, 70 cm per strap, including seams and overlap with the facing. I couldn't get black straps so I decided to go with a contrast colour and buy red instead. All the straps on offer were also narrower than I wanted so I overlapped them a little and stitched it down with a stitched zigzag. The bag got its first outings today: a trip to the market and some regular grocery shopping. I have to get used to it a little bit but I think it will work just fine. This weekend, my relatives who live in London will be visiting my parents and we will meet them there. Which means I felt kind of obliged to work on and finish the alterations on the coat belonging to my aunt H.
To be fair, she left it with me on their last visit, in January and mentioned that it was fine if it took me over a year to alter it. She must have heard how long I took to take in my grandmother's skirts.... (which also, was no disaster. Although my grandmother had lost a lot of weight and was happy for me to take in six skirts, she has a lot of other ones so she didn't miss them too much). Anyway, H is the only relative, apart from my grandmothers, who occasionally asks me to alter things for her. Like most seamstresses, I hate doing alterations but I can be swayed to do them for my loved ones. And I know that H really can't sew, unlike my mother and other aunts. And she accepts my expertise in the matter, which is nice. It's a fairly straight , classic design but with the usual nice, tailored details. Which, unfortunately also means that the pocket welts go through the front darts, eliminating any opportunity to take out some excess width there. The front side seams were very close to those pocket welts as well, so no luck there either. 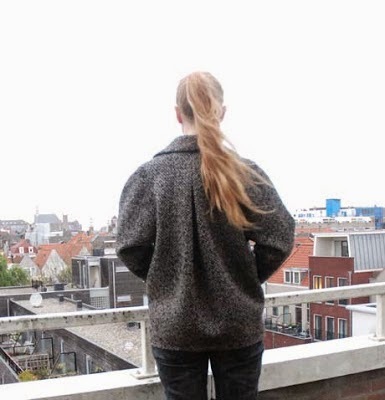 As a result of the coat's anatomy, most of the difference had to be taken out at the side back seams. I would have like to distribute it more evenly but there really was no other option. I wish I could have raised the armscye a bit but of course, I can't add material where there was none. All in all, it's quite a job. On the up side, it's a nice coat. Beautiful thick stable wool coating, nice not-too-thin satin lining. The tailoring is nothing special, all fusibles, but it has been neatly done. And I like seeing how exactly they've treated the shoulder and sleeve head. Not that it's news to me but, that's how you get that nice rounded edge at the top of the sleeve. Unfortunately, I forgot to take a 'before' picture but I'll try to add one of the finished product tomorrow morning (it's too dark now). I'll be curious to see how the coat will fit her now. I don't think I gave any guarantees for this one and indeed, that's how it should be. 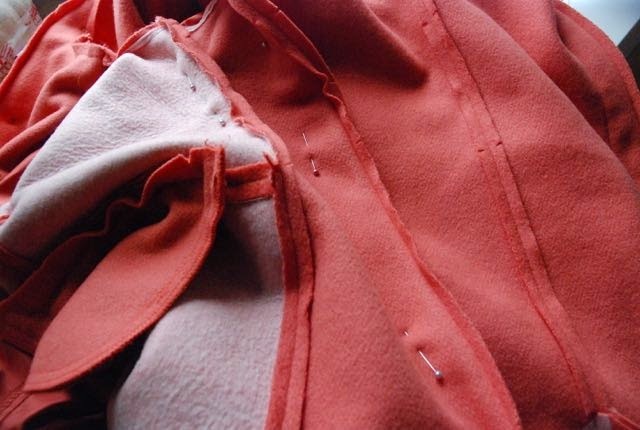 This was a lot of alteration for a complex garment that doesn't really allow for much change. 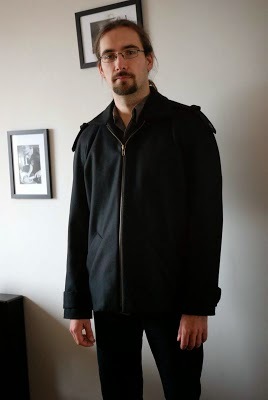 Although a lot of my sewing is rather selfish, I have been making shirts, thinner trousers (for jeans, he's a Levi's 501 kind of guy) and coats for E for years. And I've just finished a new one. 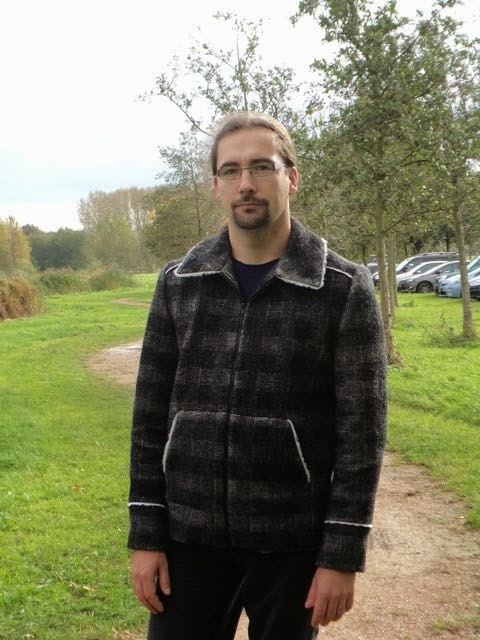 This coat, which I made back in the autumn of 2010, has served as his every-day wintercoat for all that time. And by the end of last winter, it was decidedly worse for wear. I have changed the lining at least once, maybe twice. And I've made some repairs to those nice but not always practical button tabs. But now, the fabric itself had started to pill in some places and shine in others. And the lining needed replacing again. To put it quite simply: It was time for a new coat. The were two fabrics in my stash which I though would qualify for this project: This one and a densely woven beige coating. Either would make a nice change from the plain black we have used for his coats so far. E picked this one. It is a peculiar kind of fabric: It's a thick, off-white wool knit with the checks printed on. The printing is not equally dark over the whole fabric. There is only a tiny bit of stretch and only really in the width of the fabric, so I thought it might serve fine for a coat. I decided to use the selvedge of the fabric, with the white side facing out, as a piping. 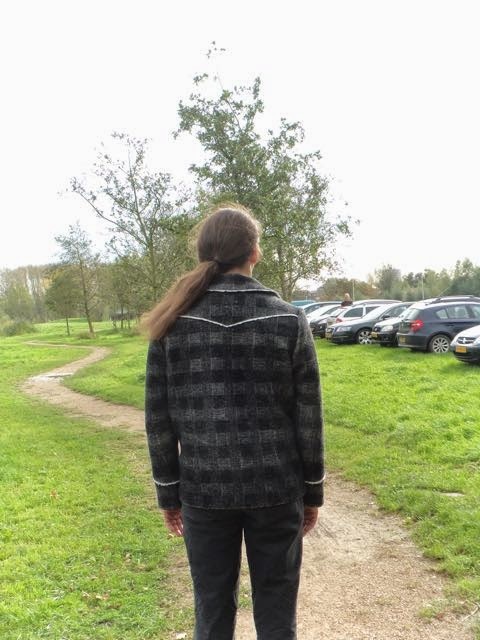 For the pattern, I kept all the functional details which had made the previous coat such a winner: A fairly roomy fit which allows for a range of movement yet is fitted enough to eh... show off his good looks ;), the length which is practical both when driving and cycling, the collar which folds down a bit lower than the standard because that is more comfortable for him, the simple zipper closure. The design details are new and I adapted them a bit to the nature of this fabric. The slanted welt pockets from the old coat didn't seem like such a good idea now. This fabric, although hardly stretchy, doesn't have the stability of that dense wool coating. And fusible interfacings (used to stabilize the yoke and the zipper edge) didn't really like sticking to it. And of course, I wanted to use those selvedges as a design detail. So, where the old coat had raglan sleeves, I went with normal ones this time but made a sort-of cuff to add the piping. I made a shoulder yoke with a point at the back. The collar is edged in the selvedges and so are the openings of the kangaroo pockets. I tried to match the checks. I even cut out everything in a single layer to do so and it was not easy. It's a knit and the check is printed on... The lines were going everywhere! I think I mostly managed it though. The zipper is a thick black plastic one. I usually prefer metal zippers but in this case, I didn't want to add another colour in the mix. You are all familiar with Burdastyle, aren't you? I've been a member for ages although I'm not as active there as I used to be. And I'm proud to have been a contributor to the first Burdastyle book. Now, I've actually sewn something using a recent pattern from the site. A first for me! My blog is part of Burdastyle's "Best of blogging top 50"! It will be announced on the site later (after some upcoming change) but we are allowed to tell it on our blogs already. I'm very happy with this. When you are blogging away, like I do, you have no idea how many people really see and/or like what you do. Not if they don't comment, that is. Blog statistics are all well and good but they don't register appreciation. This does. So thank you very much and I will try to keep up the good work! So I did. This a 'draft your own' pattern, so you don't have to deal with printing lots of pieces and taping them together. And unlike most tutorials you find online, it comes in two sizes (sort of S/M and M/L). - The dimensions for the pieces are without seam allowance. This is the standard in the Burdastyle magazine (at least in European versions, I don't know about the American one) but it doesn't really make sense for such simple pieces which you might draw straight onto the fabric (which I did, adding seam allowance as I went along). 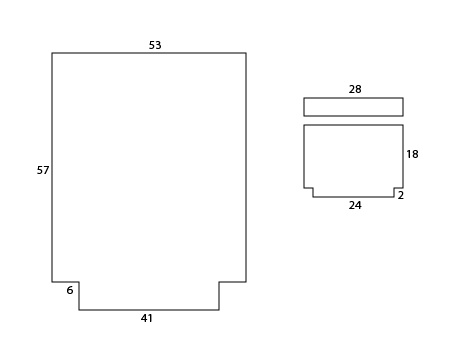 - The drawings for the cutting lay-out and even the listed amount of fabric you need are for fabrics of 110 cm wide. Which, to me, seems like a really unusual width for knits. The vast majority of those are 140 to 150 cm wide, in which case you only need the length of the body piece plus the length of the sleeve (or even just the length of the body. 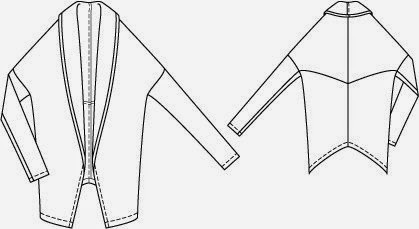 If your fabric is 150 wide and you are cutting the cardigan in the smaller size, you should be able to cut out the sleeve next to the body piece). 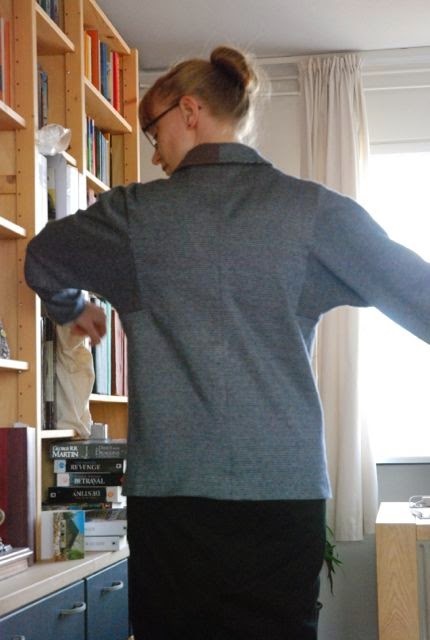 - If you make the cardigan as described, the wrong side of the fabric will show at the 'collar' (which is really just the folded-back front edge). The instructions don't really warn about that. I noticed straight away, but a less experienced sewer might not. My fabric doesn't look good on the wrong side so I cut the front edge with about 20 cm extra on it, which I used as a facing. Worked just fine. Oh, and the sleeves are long. Longer than they have to be. I shortened them just a little because, with the 'object' shape, the length of the sleeve on your arm depends rather heavily on how you wear the cardigan. The fabric has been in my stash for a while and I thought the stripes would work particularly well with this design. I was right about that... I really like the look of the back! To be honest, it's the back I'm happiest with. Apart from the stripes, the shape is really interesting too. I'm less sure about the front. 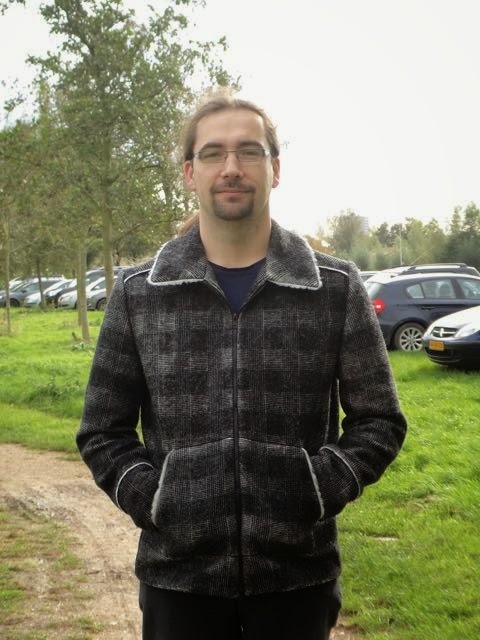 I've never looked great in longer cardigans. This one doesn't look bad at all but I'll really have to think about how to make it work in my wardrobe. So, there you have it, my first garment from a Burdastyle pattern in a long time. We rush through the labyrinth of Paris - from the Rue Royale to the Avenue Montaigne, from Faubourg Saint Honore to the Place Vendome. We rush from one fashion house to the other and our invitations, sorted by date and by hour are a maze of addresses spaced far apart. A large gate, a small shop. A stately staircase, an elevator which gets stuck between one floor and the next. Luxury salons, everywhere different, everywhere the same. In all of them, a heated battle over a place on the front row, over the first cocktail, the first nibble. Everywhere the same reporters. One third, gilded chairs, always a bit too narrow. Heat like in a submerged submarine. Crystal chandeliers and business-like spotlights which shine a dazzling light over it all. Flowers, sales-girls, waiters. Waiting for three quarters of an hour, until the first model steps out and is gone again before the international murmuring subsides. But even if the first outfit misses out, there are so many more to follow (collections of 170 pieces are no exception) that we we will have trouble deciphering our hasty notes later on. For one long week, we caught show fever. Three or four shows a day kept us up, half-asleep, until well after midnight and we wrote down the specifics from the most important collections. So, let us raise the curtain for you: We are not faced with a revolutionary new spring fashion! Except the adaptation of our wardrobe to the change in season, it will continue after today like it has been since the start of the first half of this century. Beautiful and diversified versions of everything which has been produced in the field of fashion over the past few months, are presented to us. We will be able to build our spring wardrobe in a pleasing style with the help of details from previous seasons. If nature allows us, we will continue to wear the rounded shoulders, a small waistline will still be our ideal and the hips will still be round, artificially so, if necessary. For the rest, we have a choice from such a wide range of possibilities that there will be something to everyone's taste. In one collection, bodices are close-fitting, in the next the are a bit wider, sometimes they are strict and have a straight button closure, in other cases, they are less sober or even a bit wild with a shawl-decoration or some drapery. Sleeves show themselves in every length imaginable, either cut on or set in, or (like at Dior) a combination of both. Cleavages, modest in day dresses, play a varied game in the dressier outfits. They are round or oval, V-shaped or variations on the U and W form; they are cut up high against the neck, reach just to the nape of the neck or leave part of the back, shoulders and chest uncovered. Small, often very narrow collars are a favorite but large collars are also shown. a slim skirt and which are responsible for the surprising and elegant play of skirts which most designers have picked as their leading principle. Often, these gores, which are not used in walking clothes, are achieved by draping. This is especially in evidence at Fath's. 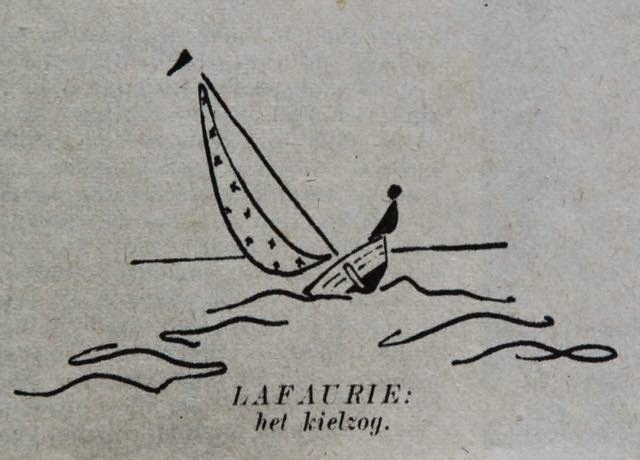 This designer presents his collection in the sign of the "arrow" and the "bell". Maggy Rouff, who, like so many others, is a fan of the apron skirt, launches her creations under the motto of the "moving line". 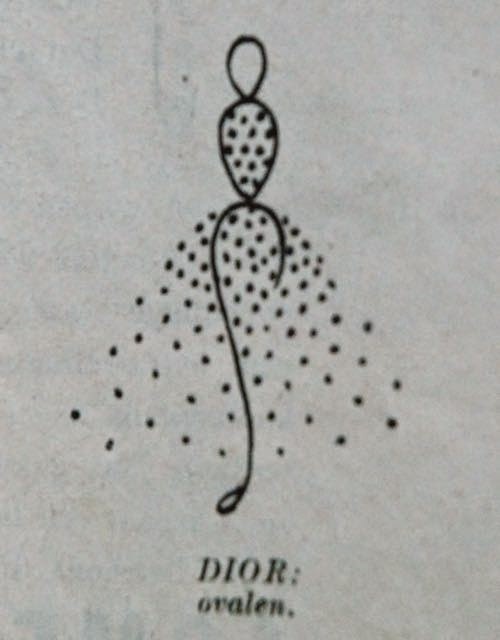 Paquin chose, among other things, the X as a motif in his collection, while Diro shapes the ideal female figure from nothing but ovals and Lanvin covers her in the contours of a spinning top. Piguet is inspired not only by the pencil but also by the dancer and Lafaurie opens, in a marvelous collection, countless possibilities by taking the waves and curves of the wake of a ship as her guideline. Griffe, who, based on his recent creations, is the furthest removed from his colleagues, plays with grey and sober strictness, which he interprets with refined modesty in the governess dresses. Less capricious than the dresses are the coat, which, in any form, are fairly simple. The most eye-catching characteristic of the new is the narrow stand or collar, which is often combined with a low neckline. The classic lady's suit, much seen behind the scenes, had to yield its place in the shows to the novelty versions, which enjoy a lot of attention in the spring fashion. Of the most interesting details we note: the peplum which is only rounded at the front (Griffe) and the long shawl collar which gets wider on the way down. The fashion, as it was just launched, has a lot going for it and yet - despite the ravishing fabrics, the fairytale colours and the original prints - little news. She who opens a fashion magazine from last season, will find in it much of what we could not discuss yet in this short article. 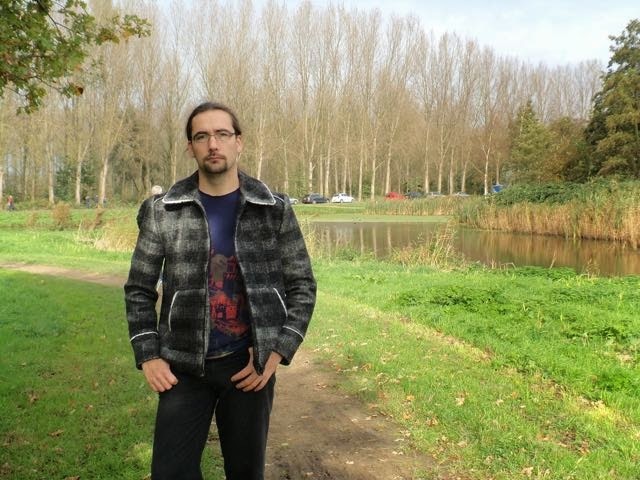 By the way, this is the first time I've translated an article from Beatrijs magazine (previous ones were from Libelle. 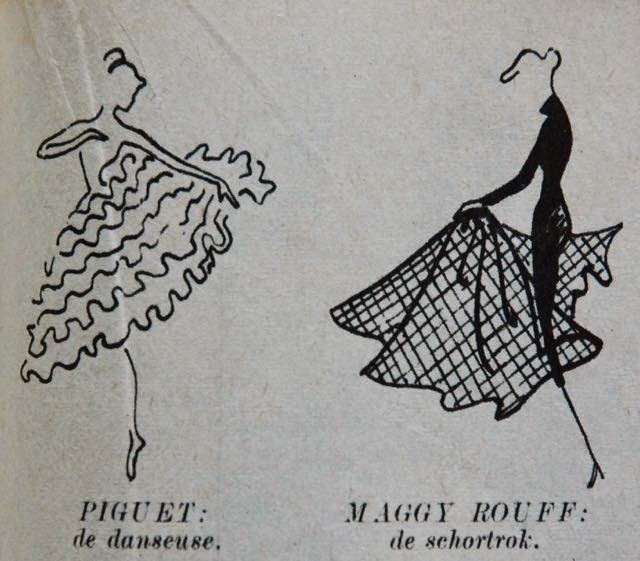 Often the work of their 1940's fashion editor Caty Verbeeke). I hope you like it. I think such pieces give some nice extra insight in an era of fashion which many of us love. I like designing, drafting and making jumpsuits. And rarely in varieties you could find in stores. In fact, I even wrote a tutorial about it for those among you who might want to do the same. I've made another one. 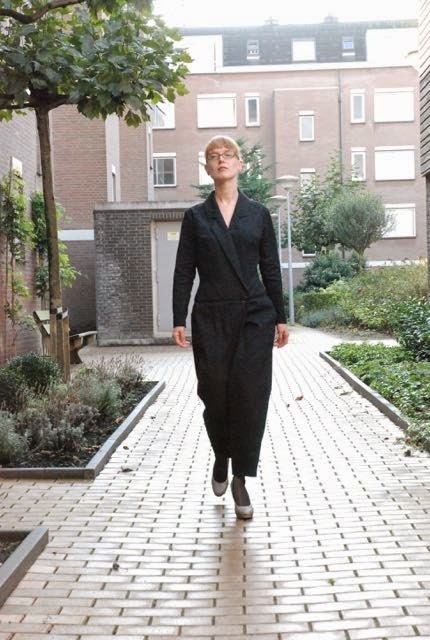 In these odd weeks between late summer and autumn, I ended up making a jumpsuit I've been thinking about for a while. At least since last spring, probably longer. I've also had this fabric earmarked for it for almost as long: It's a black cotton/linen blend with a slight windowpane texture. It's also a little heavier than most of the linen I come across. This is the jumpsuit I imagined (please ignore the dress sketch in the upper left corner. 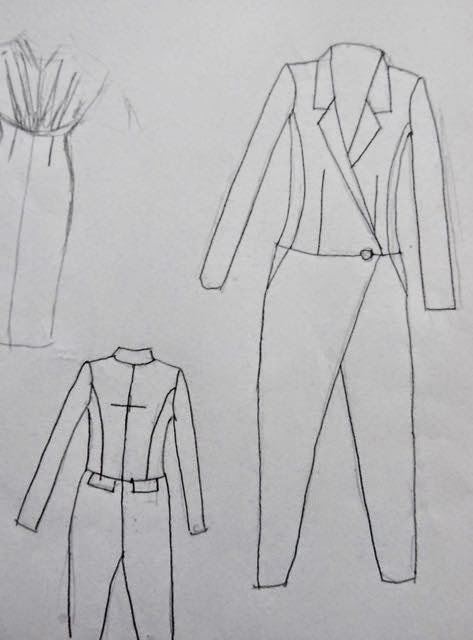 I often put lots of sketches on one sheet of paper): functional wrap-over front bodice, connecting to a pleat in the trousers. Dropped waistline, notched collar and, of course, pockets. And that is just what I made. I drafted this design starting with my usual slopers (although I altered the bodice into a version with less ease at the chest. I thought that would suit a style like this, with an opening over the chest, much better than my usual, almost 1950's style fit. And I think I was right). If you are reading this with my jumpsuit tutorial in mind: I used a 'relaxed fit' trouser block (so, one with a crotchline lowered by 3 cm) but, because I didn't want the jumpsuit to be really baggy, I only added 2.5 cm at the hip when turning it into a pattern piece for a jumpsuit. And as odd as these trousers may look with their wrap-over pleat, they are actually complete symmetrical. The bodice is styled like a jacket, with a side panel and two-piece sleeves. Because I am a pattern nerd, I had to make the front side seams line up with the slash pockets on the trousers. And the buttonhole for that single button is in the seam between bodice and trousers (although I added three hidden snaps after the photoshoot to keep that long front edge in check). For the inside part, I made a thread loop which closes on a small button. Back from holiday in Scotland and kind of convinced that autumn was just around the corner, I decided to make a nice bulky cardigan. You know, the kind of thing to snuggle up in on a dark evening after a cold day. Although, knowing myself and the good state of heating in my home and many other buildings, I didn't pick a particularly warm fabric. This stuff has been in my stash for a year or so. It's cotton and something. A thick-ish jersey with narrow white stripes on dark blue on the good side and white, blue and red in a sort of tweed effect on the reverse. It has a little bit of stretch width-wise and none at all vertically. If I remember correctly, I bought this fabric with this particular project in mind. It just took me a while to get around to it. 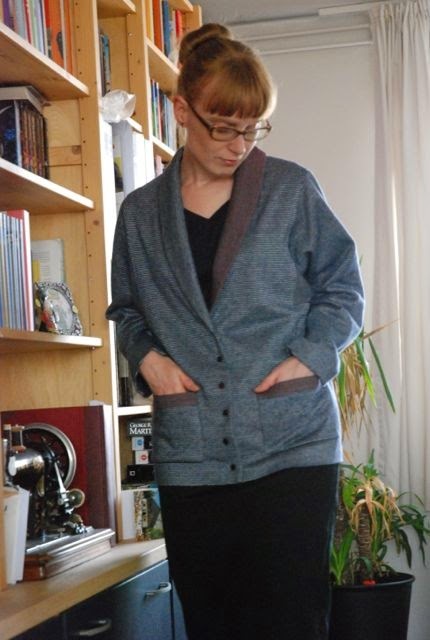 The idea was to make a cardigan with a shape based on my beloved short winter coat. This one. Made in 2009 and by now really past its best but still a design I love. Loose shape, only kind of fitted at the bottom, back pleat, sleeves with a square bottom edge. For the cardigan version, I wanted it to be single breasted. 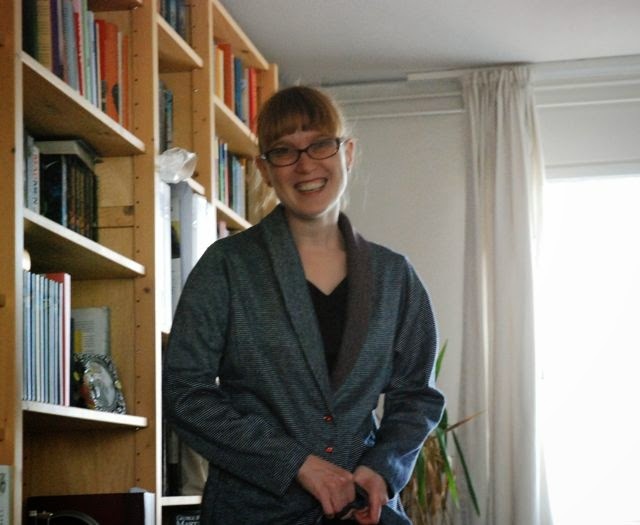 And I've wanted a cardigan with a shawl collar for a while, so why not this one? It was going to be unlined, so it would have to have a different kind of pockets. And I when I bought the fabric, it was on the bolt inside out. So the wrong side caught my eye first. In thinking about sewing with it, I tried to come up with a way to incorporate it in the final look. There was not enough fabric to cut a new left facing, so after some consideration, I decided to use the piece I had inside out. Then, I could try it on for the first time... Big disappointment. 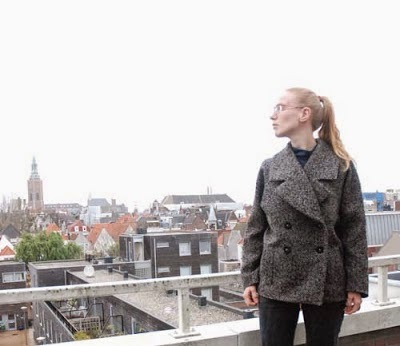 The roomy shape of the coat is sculptural and interesting. This cardigan, in its softer fabric, just looked baggy and sad. I was almost ready to leave it at that but, with E's input, I decided to try and save it. To do so, I sewed up the back pleat (which I love so much in the coat...) and took in some room in the torso and upper arms. Eventually, this was the result and I think it's pretty wearable now. I ended up adding patch pockets (the bottom edge sewn on by machine from the inside, the sides sewn by hand) which show the wrong side of the fabric at their top edges. Picking buttons took more thought than usual as well. I wanted to use jersey snaps with an 'old red copper' finish but those didn't work. The prongs on the snaps were too short for two layers of this fabric. I wanted a look like that though. Small and kind-of-contrasting buttons somehow made for a less frumpy finish than anything larger and/or matching the blue or white. After searching both my stash and the market stall where I usually buy my snaps and buttons, I found these: Small red buttons which match the red in the wrong side of the fabric. They are the size of shirt buttons. I didn't think such tiny buttonholes would work well in the thick fabric so I sewed snaps under the buttons. I happened to have transparent plastic snaps in the exact same size as the buttons, so I used those. That little coincidence makes the improvised closure look almost intentional. In my post about my Little Black Dress, I mentioned how I originally wanted to make it as one of the 'adaptable' dresses featured in so many early 1950's magazines. I don't know if you are familiar with that particular concept. 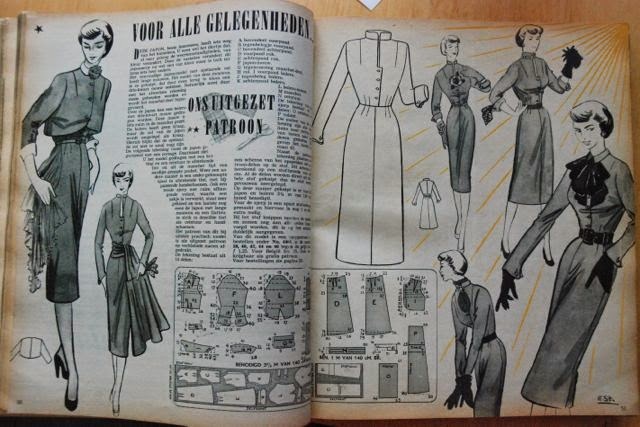 So, when I came across an example (when taking pictures of nice dresses from the pages of 1950's issues of Margriet magazine for my growing Pinterest boards) I thought I would show it. This particular dress was featured in the magazine with instructions to draft the pattern in size 42. 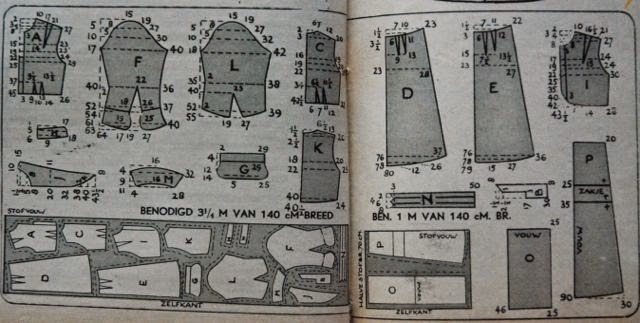 The pattern could also be ordered in the sizes 38, 40 and 42. The philosophy behind this type of dress is obvious: Rationing of fabric had stopped by the second half of 1950 but fabric was still relatively scarce and expensive. The vast majority of women had to plan her wardrobe with care: Spending little and yet getting the most from those items in terms of variation and style was the ideal. 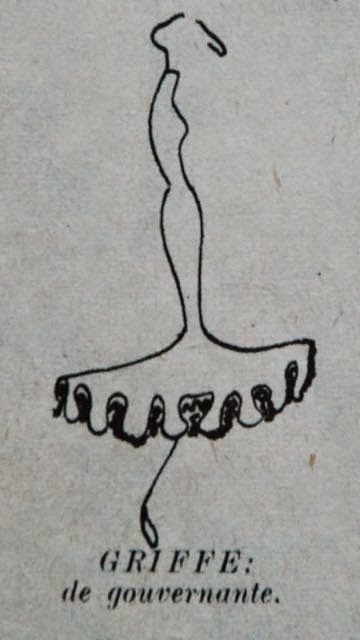 The title of this article is "a dress for all occasions" and the illustrations for this one are particularly clear. The dress is quite typical for its type: It has a straight, slim skirt and a very simple bodice. Even the collar is very understated. Which is typical too. Many dresses like this didn't have a collar at all and could be accessorized with that other favorite of this era: Separate collars and cuffs. Most variations on the right page are pretty straight-forward: Different belts, a scarf worn in the neckline, pins. The left page is more interesting: A jacket and a sash with pockets. The sash creates the looks of a skirt-with-flounce, which I really like. I've seen many examples like this from 1949 and 1950 and I keep wondering about them. I love a skirt with a flounce but I really wonder if this very simple option would really look so well in real life. And I'm sure I have even seen a version somewhere with pocket bags with flaps on a belt. Because I already blogged about working on it, I'm letting this latest lingerie-project jump the blogging queue. As mentioned before, a couple of years ago, I loved the racerback bra from H&M's 'our perfect' range. But now, I've been getting some practice at making my own bras and their new version has big push-up pillows. So, I tried making my own and I'm very happy to announce that it worked! I had expected some issues with having to adjust the shape of the upper edge of the cup because I was cutting it so much lower at center front but no... Apparently such fitting don't occur with things worn so close to the skin. I had to make one alteration after finishing it: the center front, small bits of ribbon holding the clasp-thing, was just a bit too wide. That is an easy mistake because I had to sew it on based on the measurement of the bridge in the original block. Which is, of course, a piece between the curved lines of the cup so even placing the ribbon a millimeter higher or lower than the spot where I measured had to result in a fairly serious fitting issue. So, early this morning, I painstakingly unpicked part of the underwire-casing to get the ribbon out and put it back in, a bit shorter. Now the fit is spot on. The bra is made from a black lycra, black foam (the sheet variety, not pre-shaped cups) and black lace. The little clasp came from one of my old RTW bras. The cups have a diagonal seam. Unfortunately, this style is particularly hard to photograph because there's so much going on in the center. That's why I used a piece of paper again. And of course, unfilled cups always look a bit odd. This will be quite a nice bra. I like this kind of shoulder-strap arrangement. No issues with straps sliding off. It has always surprised me how little you see this shape outside the realm of sports-underwear. If you want to try and make one, it's not difficult although you would have to find an appropriate closure. If you have a bra pattern which is meant for a plunge style underwire (so, one which is quite low at center front, just like all RTW bras which are not balconets), you really only have to adjust the band and replace the bridge with the closure on carefully measured straps (my RTW bra used tubes of lycra with non-stretch material inside. I decided to cut down on bulk and fiddly work by using pieces of velvet ribbon). Here, you can see the wings of the racerback bra in red, over the black outline of a regular bra. The bottom line is made higher to eliminate the piece under the cup. Some patterns are already like that. To find out how much longer it has to be, take a bra made from the original pattern, close the band at the setting you usually wear it and measure the length of the closure. Mine was 5 cm. That is the length you have to add to the total length of the band. So you add 2.5 cm to center back. And of course, this pattern piece has to be cut with the center back on the fold. For this style, as for any style that doesn't have material from the band under the cup, it is essential that there is space to add the underwire casing to the cup pieces. If, in your pattern, the underwire casing is sewn over the joining seam of band and cup or sewn to the seam allowance as close as possible to the joining seam and then turned out on to the band, you have to make a change. This one: remove the seam allowance (I use 1 cm there) from the cup edge on the band pattern piece and add it to the cup pattern piece. Now, to put the underwire in place, you sew the casing to seam allowance of the joining seam (of course, with this style, there only is a joining seam at the side, for the rest, just sew along the edge at the same distance) from the outside of the cup and then fold it in to the cup and sew it in place. Ehm... I hope that makes sense. I've you've made bras before, this shouldn't be difficult. I could show it quite easily, if I were explaining it to someone in person but to write about it in such a way that it can be followed is quite a different matter. I'm no bra-making expert but if several people are interested in how I do the construction of mine, I could try and make a proper tutorial. Oh, and if you've never made a bra before and don't understand, please try a normal pattern first. Preferably one which is reviewed favorably by others for its instructions and fit. Bra making has both a language and a way of working which takes a bit of getting used to. And about getting used to things: Wearing a racerback bra if you've never done so before also takes some time. You'll probably be quite aware of the center back piece for a day or two. After that, it's quite comfortable and it won't bother you anymore, even if you alternate between racer backs and other bra styles. Which I heartily recommend. Wearing different bra styles prevents the formation of permanent 'cuts' and dents in your torso and shoulders. Let me know if you want me to explain more about how I make bras but please don't expect me to produce a full pattern or fool-proof instructions very quickly. Something completely different: I have, a long time after everyone else, joined Pinterest. I never really saw the point until I caught myself using my old blog posts to remember and look at images from magazines in my collection. It is clearly much easier to keep track of a the pictures I like when I put them together on the computer... And isn't that something Pinterest is for? And then, I can easily share those pictures with you as well. I have started taking pictures of fashion from my vintage ladies' magazines and I'm sorting and pinning them according to the features that caught my eye. I have only done about four years yet, so there is a lot more to follow. And then there are the sewing magazines... I think I'll just let the boards grow slowly. It's here. I'm not at all sure that link works as it should because it goes to my profile when I was logged in. I'm pinning as Lauriana Petitmainsauvage so you should be able to find me that way. Yeah! We've finally taken some pictures! To talk about this dress, I have to go a bit back in time. 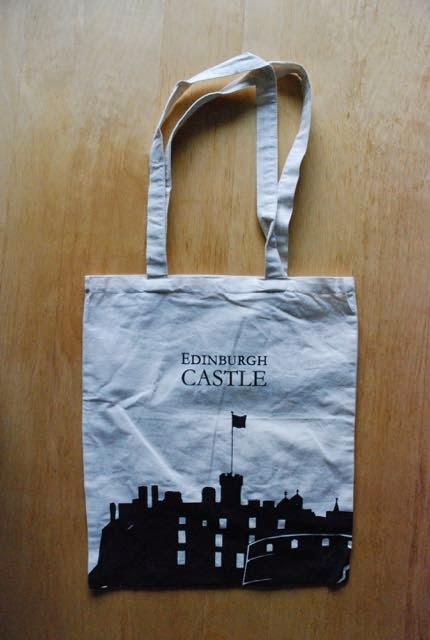 I started making it before our holiday and had every intention on bringing the finished product with me to Scotland. However, when it was half-way done (after inserting the side zipper) I realized I had to take in the waist a bit more and I didn't want to waste time with a seam ripper which should be spend packing. So, I left the dress until after the holiday. It's a humble fabric: mid-weight stretch cotton with a bit of a satin-y finish which allows for the subtle woven-in design (a kind of random floral, impossible to photograph in black-on-black). I figured it would be perfect to try out a design like this. If successful, I can come back to it with some nice wool crepe. And this stuff is easy to wash and I don't have to worry about it. I threw away the first dress earlier this year for two reasons: It had become too tight at the chest and the combination of this fabric and fitted kimono sleeves with underarm gussets didn't work out. I had reinforced the points where the gussets were inserted but they ended up tearing and fraying none the less. So, the new dress was not going to get sleeves like that. After some consideration, I decided not to give it sleeves at all. My initial plan was to make this a 'basic' dress, one which could be altered by wearing all kinds of stuff with it: scarves, belts, a jacket, separate pockets (on a belt), a removable peplum (magazines from the early 1950's are full of designs like that). And that is the reason why it doesn't have pockets or some other skirt design. However, as usual, I'm shying away from the notion of add-ons. Although of course, I can and will wear this dress with just about every cardigan and jacket I own. 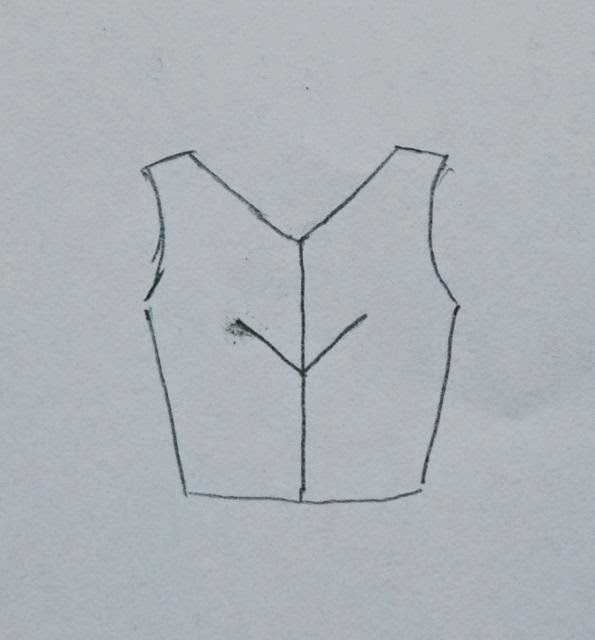 So, the dress has a shallow V-neck at front and back and the front darts are shaped like this, with the dart parallel to the neckline. Although you can't really see that in the pictures either, you can tell from the shape. This is the one dart treatment which really shows two separate breasts... (and I'm wearing my me-made modern-technique-retro-shape bra). The bodice is lined in a thin black cotton. The skirt is a simple pencil skirt with a back vent. I have made sure to give the vent a generous overlap and to interface its sides. You so often see skirt vents gape wide open and I think that's a terrible look. Now, I normally don't 'tailor to the bone'. I tend to believe there is a reason for ease in clothing and no matter how fancy the thing I'm making looks, I want to be able to do more in it than stand about and look pretty. The combination of this design and this fabric introduced its own demands though. The fabric has enough stretch to allow me to move properly even when it fits closely and it somehow doesn't look right when it doesn't. As a result, I've had to take in a bit in both bodice and skirt. I'm not so sure how that would translate to a different fabric. For now, I'll just wear this little black dress and see how I'll like it and how it will perform in my wardrobe.